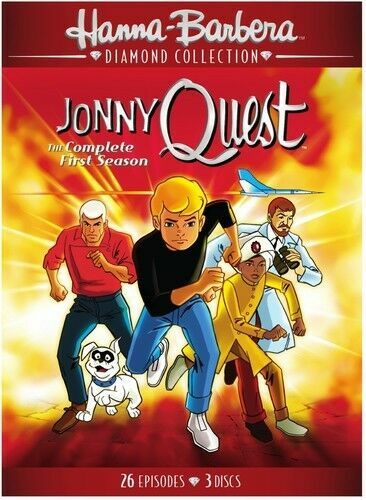 Jonny Quest is one of my favorite cartoons but I've never seen all the episodes. Here I'll just be looking at the original series. I'm going to be sharing my thoughts as I go. 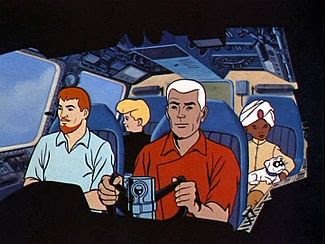 Jonny is accompanying Dr. Quest and Race Bannon on their search for a lost city in the jungle and they immediately run into trouble. Their guide Montoya falls into a pit trap and narrowly avoids being impaled on spikes, and the other tribesmen accompanying them are soon scared off after attacks by natives. Montoya pleads with Dr. Quest to give up, but Quest is adamant about continuing. He asks Montoya who might want to stop them from exploring the lost city, but Montoya says he doesn't know. After the Quest expedition goes on without him, Montoya shows his true colors, giving instructions to the very same tribesmen who attacked them. Apparently the government of whatever country they're in (it's not specified) asked Quest to investigate the ruins, so he's not just treasure hunting. They soon make the acquaintance of a large toucan, who tags along for the ride in their jeep, much to Bandit's annoyance. The lost city of Malatan was built by a civilization about which nothing is known, and as they begin their investigation they spy a reflection coming from one of the pyramids. Someone is watching them- someone named Perkins, who is spying on them with his binoculars- and Montoya is with him. Oddly enough Quest and Bannon start digging without actually investigating the pyramid, and Perkins meanwhile instructs Montoya to leave an uncooperative tribesmen out for the vultures. Then he tells Montoya to scare off the Quest expedition- Montoya would rather just kill them, but Perkins is afraid that will alert the authorities. Meanwhile Bandit gets in the usual trouble, encountering an anteater and a large gila monster before the toucan, of all things, comes to his rescue. Jonny and Hadji are of course poking around and they find the hapless tribesman who was left for the vultures. After freeing him Dr. Quest realizes the kids are in danger and that they need to pull out, but later that night while they are asleep Perkins has their tents set ablaze. 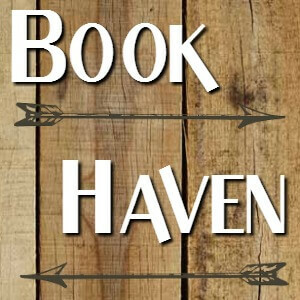 They manage to escape and are in the process of leaving the next day when Jonny discovers a secret room- full of treasure. Unfortunately Perkins and his men show up, and after a rather entertaining battle in which Dr. Quest knocks a man out with thrown pottery, they are captured. Not for long, of course, this being Jonny Quest- it turns out the tribesman they rescued now frees them, leading them to an underground river and some convenient canoes for them to escape in. Too bad Perkins is on to them, though, and they're soon pursued down the river by him and his men. Things get out of hand with crocodiles and near misses- with Race battling a crocodile underwater- before they come out into a subterranean lake in a cavern full of stalactites. Race has the idea to shoot a few of them and they land in Perkins' boat, causing it to sink. The crocodiles do the rest and... it's goodbye Perkins. No word on Montoya though- did he survive? So the tribesmen are free of Perkins and his influence and are all friendly like now. Quest and company can depart and Bandit gets a send off from his new friend the toucan. This is a pretty middle of the road episode, as these things go, although I thought the underground river was a nice touch, and definitely saved the episode from being rather boring. And vampire bats too- mustn't forget them- that could maybe raise my rating, but no I still think this episode is just a little subpar. I give this one 2 of 5 stars. I never watched that cartoon as a kid. I never watched all the episodes either, but the commercials were always fun to watch!